It’s all over but the criticism. After 13 years, Peter Jackson has finished his six-movie Lord of the Rings series, with three movies telling the tale of the Ring of Power, and three about Bilbo Baggins, the hobbit who started it all. There are countless extra stories set in Middle Earth and Tolkien’s world, a million more movies that could be made, but this sure feels like the end of an era. As a huge fan of the books and having read them all countless times, I both love and hate that these films were made. I loved watching the stories come to life, was so excited about the first film in 2001, and felt proud of how well the original series did, capturing nerds, film buffs, and the general public. But I also hated that the director would be making choices that changed the original text, that left out scenes, that added in extras elements. Basically I wanted this to come to life, but I also wanted to see what was in my head. Perhaps that makes creating these movies an impossible task to perfect, but that won’t stop me from being mean and pointing out just where Peter Jackson failed. In the last chapter of the story of Bilbo, we find he & his dwarf companions at the Lonely Mountain, the birthplace of Thorin and the end of their quest. They’ve come a long way, had many adventures, found their way into the depths of the mountain, and Smaug the dragon has left to destroy Laketown. 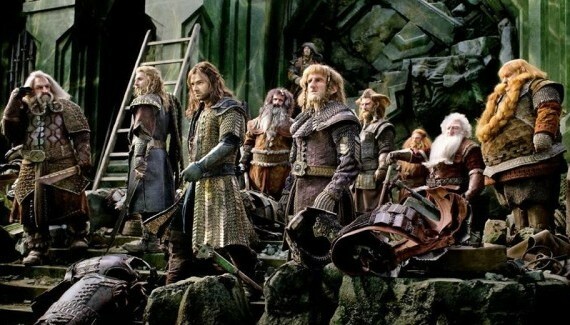 The dwarves are now free to loot the gold, reclaim their places in this ancient kingdom, and Bilbo is free to go home. But perhaps not quite yet. As word spreads that the King Under the Mountain has returned, many want a piece of the treasure that has sat there for so many years. Bard leads the men of Laketown up the river to the mountain to claim recompense. The elves gather out of the forest to claim their ancient jewels. And evil comes down from the North, sensing an opportunity to take the Mountain as their own. A battle of five armies will ensue, a war that will set the table for many battles to come. And with an ancient evil dwelling in nearby Mirkwood, the control of Middle Earth might be at stake. It’s been difficult for me to accept these new movies. The Lord of Rings series I enjoyed; three movies for three books, the visuals were amazing, Jackson did what he could with the story, only leaving out what was necessary and trying his best to stay true to the original text. The Hobbit movies were different. Three movies for one short book, a mess of added ideas & scenes, nonsensical action, and something that never felt like Tolkien. An Unexpected Journey was weird to say the least, with added enemies taking away from the story but classic scenes made well enough to force some to overlook the pulp. The Desolation of Smaug was even worse, delivering countless imaginary action sequences and love stories that made no sense and were nothing close to the original novel. After the first two movies, I felt like giving up, felt that Peter Jackson had gone off the deep end, leaving this amazing book behind and making movies about whatever he thought the audiences would pay for. The Battle of the Five Armies proved only slightly different. It still had scenes created from the subtext of the Tolkien books, namely Gandalf fighting the power that would become Sauron. These events are offscreen in the books, so I can’t completely blame Jackson for adding them into his bloated movies to fill time; they kinda exist and it’s kinda cool to see them onscreen. The whole Legolas/Tauriel/Kili love thing is stupid and totally fabricated. That’s the stuff that makes me angry; the added elements, the personal battles between orcs that have no characters in the book, action scenes that were shot for action’s sake alone. As a fan of the book, I’ll never understand why Jackson decided to flesh out the story with idiotic fight scenes that never happened. But thankfully it wasn’t all bad. There was actually some acting *gasp*, and some feeling *double gasp*, that made the story watchable. Bilbo & Thorin, their relationship, greed battling good; I guess I can find some aspects to grab onto so that I can enjoy the final movie in what has been a large part of our lives over the last decade. 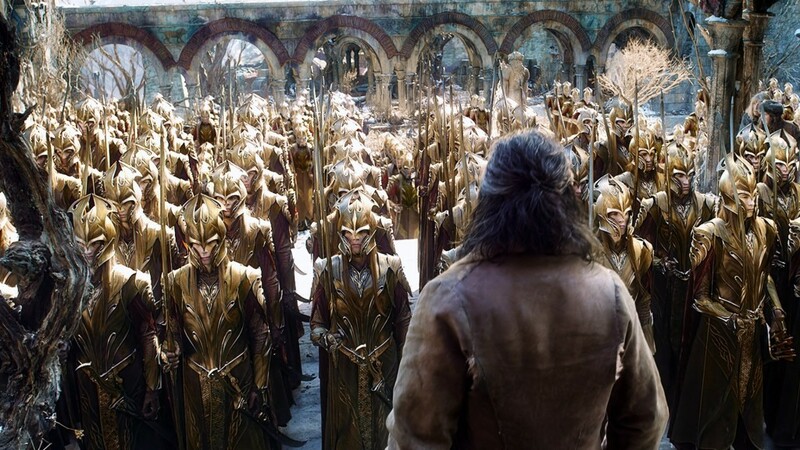 As Return of the King was the best of that series, The Battle of the Five Armies is the best of this one, a solid ending to a series that Peter Jackson shouldn’t be proud of.